This is a printed tag with the graphic in the product picture printed on a flat tag. 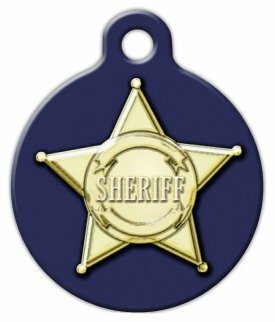 The sheriff’s badge is not a separate raised metal piece. It is simply an image. When looking at the picture, I thought it looked like an actual Sheriff’s star attached to the tag. Instead, it was a digital (somewhat grainy) image. It’s not what I expected, but it will do the job it was designed for. My cat, Sheriff, does look awfully handsome in it though.